Hold on to your children to keep them safe. It is incomprehensible why some parents and guardians continue to fail or refuse to appreciate the severity of their actions by causing children to eventually become victims of neglect. LIKE many Malaysians, I was heartbroken to learn that the decomposed body found near the Kampung Sungai Sireh jetty in Port Klang on Jan 24 was that of the missing six-year-old William Yau Zhen Zhong. William will now join the list of highly publicised cases of missing children who were either found dead subsequently or are still missing such as Ang May Hong (1987), Chai Sieu Chi (1995), Tin Song Sheng (1996), Nushuhada Burak (2000), S. Maniarasi (2001), Nurul Huda Abdul Ghani (2004), Haserawati Saridi (2004), Nurin Jazlin Jazimin (2007), Sharlinie Mohd Nasha (2008), Mohd Asmawi Jalaludin (2008), Harirawati Saridi (2009), Nisha Chandramohan (2010), Nurul Nadirah Abdullah (2012) and Satishkumar Tamilvanan (2012). Personally, I can commiserate with William’s parents over their loss. In my case, my beloved father Tan Sue Yong, who disappeared in 2000, is still missing. The sorrow, grief and agony experienced by those who are left behind are simply indescribable. It is sad really that despite our nation’s conscience being shaken each time a high profile case like William’s is highlighted, we continue to have reports of missing children. According to the official portal of the Royal Malaysia Police (www.rmp.gov.my), 4,804 persons were reported missing between January and October last year. Of these, 2,332 have been found, but 2,472 persons are still missing. Of the 2,472 missing persons, 1,177 of them are children, that is, those aged below 18, and 896 of them are girls. This statistic is indeed alarming as it means an average of 16 people are reported missing daily nationwide! Hence, if we, as a society, are to be judged by how we protect our children who form the most vulnerable component of it, then we may have failed miserably. This begs the question whether the majority of these cases could have been avoided if the person having care of the child had exercised due supervision and diligence. It follows oft-reported stories of thieves driving off cars with children inside are not funny at all. In most cases, the engines were left running with the children in the cars. How true indeed as it can make a real difference between life and death if a defenceless child is allowed to be out of sight even for just one minute. Sadly, despite the many reports of similar horror stories, our children still go missing because obdurate parents continue with their foolhardy and irresponsible habits and actions. It is mortifying to learn that even though we have good laws such as the Child Act 2001 (Act 611) and Anti-Trafficking In Persons and Anti-Smuggling of Migrants Act 2007 (Act 670) to protect our children, many a time it is we adults, the children’s protectors, who let them down by paying scant regard to their welfare. We also have cases of parents leaving their children home alone, exposing them to mishaps as in the case of 10-year-old Kuhesri Nadarajah who allegedly hanged herself when left at home alone in 2010 in George Town. It is also unbecoming of some parents who take their children aged below 15 to public assemblies, thereby exposing them to any untoward incident and in contravention of the Peaceful Assembly Act, 2012. This reminds me of an incident which took place a few years ago in Sungai Wang Shopping Centre, Kuala Lumpur, when I found a little boy crying and looking for his mother. He had obviously been separated from his mother. I immediately took him to the information counter and paged for the boy’s mother over the public address system. But it took almost half an hour for the mother to turn up and claim her lost child. What is worse is that the mother appeared neither panicky nor appreciative of the fact that someone had found her missing child. This led me to giving her a piece of my mind on the importance of always keeping her child by her side and within her sight, especially when in a public place. It is parents and guardians like these who ought to be prosecuted under section 33 of Act 611 for leaving a child without reasonable supervision. 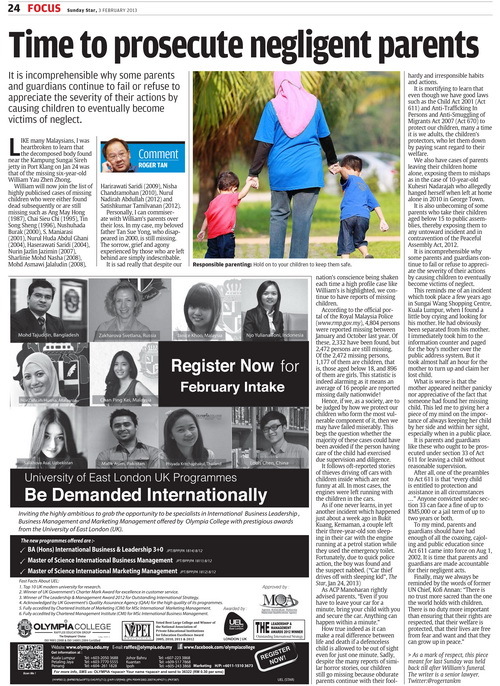 After all, one of the preambles to Act 611 is that “every child is entitled to protection and assistance in all circumstances …” Anyone convicted under section 33 can face a fine of up to RM5,000 or a jail term of up to two years or both. To my mind, parents and guardians should have had enough of all the coaxing, cajoling and public education since Act 611 came into force on Aug 1, 2002. It is time that parents and guardians are made accountable for their negligent acts. > As a mark of respect, this piece meant for last Sunday was held back till after William’s funeral.